“Houston, Tranquility Base here. The Eagle has landed,” were the words of Neil Armstrong as he became the first human to touch down on the Moon. 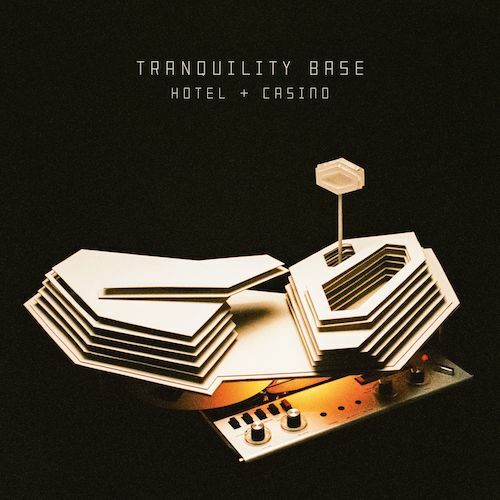 The Arctic Monkeys’ highly anticipated comeback album takes inspiration from that same Apollo 11 expedition, as Alex Turner dreams up a lunar resort named ‘Tranquillity Base Hotel + Casino’ on, as he puts it, a gentrified Clavius. Shelving stadium-ready indie rock in favour of a sparkling vintage cosmic voyage, this record marks the Monkeys’ first step into a surrealist universe, away from the trademarkedly down-to-earth drunken and lust-fuelled tales we’re all so familiar with. While the previous, banger-crammed ‘AM’ album drew an obsession for sleazy melodies and doo-wop hooks in every nook and cranny, this piece could hardly be less interested in catchy pop bangers. Anyone hoping for a reprise of ‘AM’ or earlier exploits will risk feeling extremely short-changed. “You’ve done five albums now, you’ve done the Olympic opening ceremony, you’ve headlined Glastonbury twice and you’ve won all sorts of awards. What else is there to achieve?” Susanna Reid asks Turner, back in a 2013 BBC Breakfast interview. “Maybe the ambition lies in the studio a little bit more now,” he answers. Five years later and Turner’s grand studio ambitions have been realised. The frontman has spearheaded the creation of a sharp and palette-cleansing left turn, one that will do anything but draw consensus in an increasingly fragmented fandom. This is a measured and cohesive cinematic journey - as if soundtracking a sheeny noir sci-fi hit - twisting with cohesion and regularly orbiting beauty. However, it’s prone to floating into purposeless space. Its second half is guilty of this on more than one occasion. The Last Shadow Puppets-esque ‘She Looks Like Fun’, for example, is a lukewarm mid-tempo meander that offers little more than aesthetic padding. Nevertheless there’s enough on here to call Turner’s roll of the dice, in his swanky dreamed-up casino, a real success. The ’70s glam rock of ‘Four Out Of Five’, a tongue-and-cheek sales pitch for the hotel central to the theme, forms at least one song you can imagine translating brilliantly in a live format, while the chorus (and there aren’t many) of the title-track is another ensnaring highlight. “Have I told you all about the time that I got sucked into a hole through a handheld device?” croons Turner on ‘Batphone’, with a brazenly superficial yet oddly endearing voice. His scepticism of the advancing grip of technology might explain his notorious absence from social media - perhaps he’s bought into the hellish central themes of Black Mirror during his time off. The sheer level of audacity on show is to be admired - yes, the record would have sold in abundance no matter what its content, but credit to the Monkeys for believing in ‘The Album’ as an art form; not dropping any singles in preview (despite the reign of playlists) and placing faith in a cohesive, experimental and commercially-disinterested LP. The most pioneering bands in history make music that doesn’t initially make sense and which refuses to pander to the needs of fans - they forge unexpected and original directions. Hence why you’d be forgiven for feeling underwhelmed after this piece’s first few spins, but a degree of perseverance is required before its stars can align. Whilst your first few visits to the ‘Tranquility Base Hotel + Casino’ may feel alien and unwelcoming, you will gravitate ever closer to its shimmering outer-space treasures with each stay.